American Herb Association ... Your membership to the American Herb Association includes the 20 page AHA Quarterly, which is packed with current information on medicinal herbs. Written by herbalists about herbs, it includes summaries of new scientific reports, book reviews, networking information, in-depth reports, controversies, legal concerns and letters and commentaries between the nation's leading herbalists. The staff includes herbalists Kathi Keville, Amanda McQuade Crawford, Mindy Green and David Hoffmann. 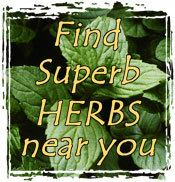 The AHA offers AHA Directory of Herbal Education (40 sources) $3.50pp; AHA Directory of Mail-Order Medicinal Herb Products $4pp; AHA membership is $20. Historical Society in Wood County, Ohio. We maintain four traditional herb gardens, a garden dedicated to native Oak-Savannah plants, a butterfly garden and many roses. Our mission is to bring together persons interested in herbs; to further the knowledge and use of herbs among the members; to make that knowledge and its application available beyond the society. Contact is made through e-mail - fbrent@wcnet.org or calling The Wood County Historical Society at 419-352-0967. Mail order site specializing in the sale of organic gardening products including beneficial insects and fertilizers. Their motto: Environmentally responsible products that work! HerbWeb A searchable database of 28,000 herbal monographs, detailing indigenous uses of medicinal plants worldwide. Perennial Plant Association ... A professional trade association dedicated to improving the perennial plant industry by providing education to enhance the production, promotion and utilization of perennial plants. Radical Weeds is Christie V. Sarles and Jillian VanNostrand's writing and publishing partnership, formed in 1995 with a simple agenda for the Garden Remedy Series: "We want a working garden in everyone's life before the FDA regulates herbs right out from under us. We want natural, safe alternatives to hormonal supplements derived from things like horse urine, and alternatives to synthetic anti-depressants with lasting side effects, and alternatives to antibiotics that can no longer effectively treat drug-resistant bacteria. We strive to see people empowered in personal health care. And we want to pass along what we've learned in our weedy gardens over many seasons -- the power of cultivating wellbeing right in your own backyard." A portion of every Radical Weeds book sale supports Green programs that promote sustainable living. These include the Hannah Hill Nature Preserve, United Plant Savers, Women's Health & Herbal Resource Center and the Northeast Herbal Association. Unitea Herbs 1-800-UNITEAS (1-800-864-8327) Offers herbal blends in many natural food stores across the country. Call 303-443-1248 for the location nearest you. Vermont Herb Growers Association....2559 Eagle Peak Rd., W. Brookfield, VT 05060; email: larrytho@together.net VHGA is a trade network of growers, manufacturers and buyers dedicated to enhancing the art and science of herbalism through education and marketing.